Come out on December 7th for the 34th Annual Mission Candlelight Parade! Festivities will be held from 7:30pm – 10:30pm, and include over 70 brightly decorated floats, live music, dancers, giveaways, and Santa Clause, of course! The 1st float will head west from Horne Street to Park Street along 1st Avenue, and since this is the largest nighttime parade in B.C., be sure to come early in order to get a good view. 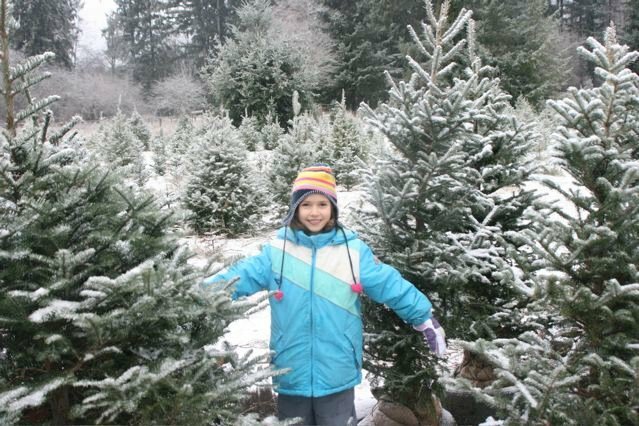 Christmas Tree Shopping along Highway 7 couldn’t be easier, with several different tree farms to choose from. Triple Tree Nurseryland is located in Maple Ridge, and is open from 9am – 6pm everyday, starting in October. The nursery is located on the Lougheed Highway, between 203rd and 207th Street. Not only do they sell Christmas trees, but festive décor as well. 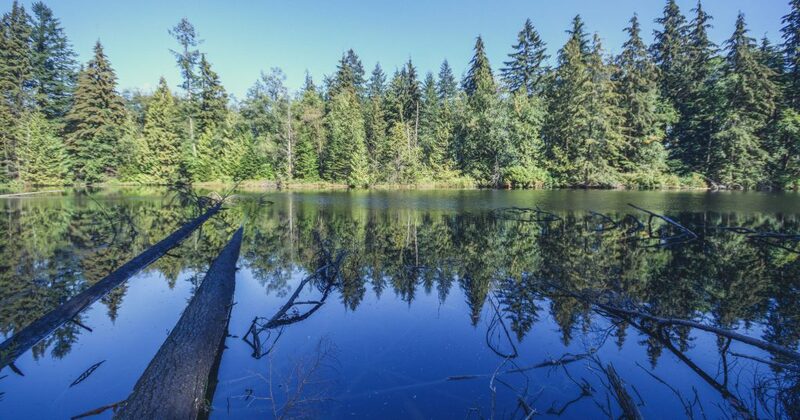 Connie-Fir’s Tree Farm is 5 miles east of Mission on the Lougheed Highway, between Hatzic Lake and Sylvester Road. They are open for the regular winter season on December 1, from 9am – 8pm for fresh-cut trees, and from 9am – 4pm for U-cut trees. Snowdog’s Christmas Tree Farm are located on Clay Street, off of Keystone Avenue in Mission. Their winter season started November 24th, from 9am – dusk Monday to Saturday, and from 12pm – dusk on Sundays. No chemicals or pesticides are used here, and all forms of payment are accepted. Carlson’s Christmas Tree Farm is in Maple Ridge on 264th Street, off of Dewdney Trunk Road. Their winter season begins December 1st, and they will be open from 9am – 4:30pm on Saturdays and Sundays. Make sure to bring the family for free hot chocolate, and to check out the mini farm animals! Cash or cheque only at this location. Alouette Christmas Tree Farm is located on 132nd Avenue in Maple Ridge, with the entrance located about 1 km down the road. They will be open from December 6th– 9th, and from December 13th-16th. Payment accepted here is cash or credit. 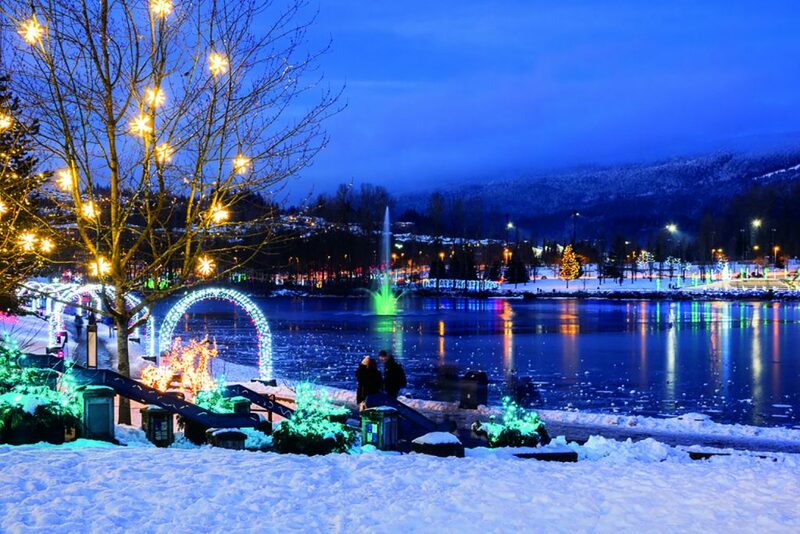 The Harrison Christmas Tree Trail is a self-guided tour that takes you through the quaint village of Harrison Hot Springs, lasting from November 23rd until January 13th. Enjoy seasonal favorites at local shops along the way, and discover the weekly giveaways available at a different business each week! 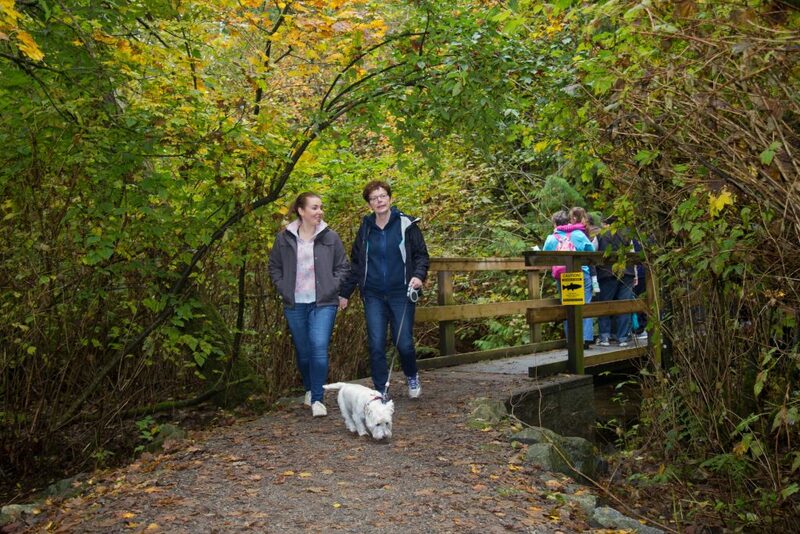 You can find a trail guide along your route, at your accommodation, or at the Harrison Hot Springs Visitor Centre. 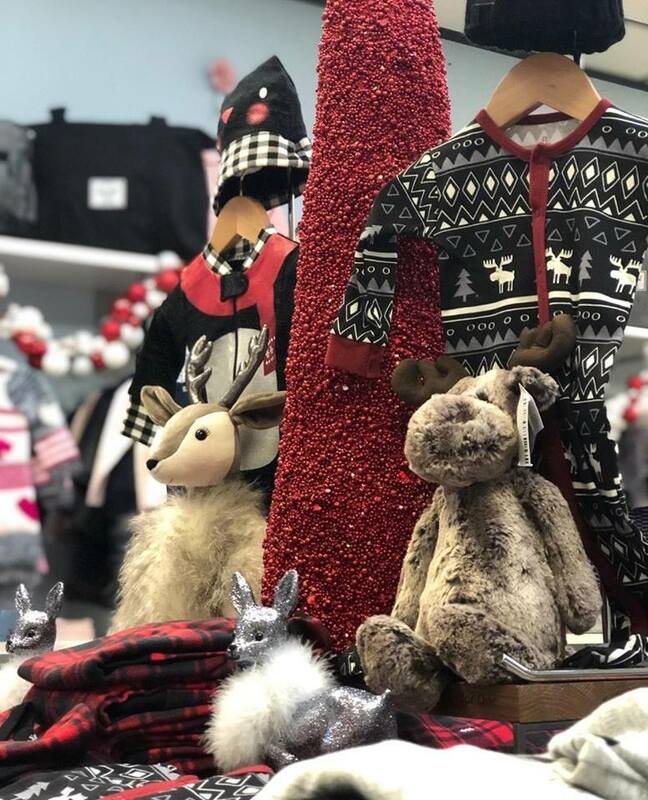 What better way to kick off the holiday season than Christmas Shopping on 224th Street in Maple Ridge? There’s something for everyone on your list, with charming boutiques selling candles, tea, jewelry, home décor, and much more. 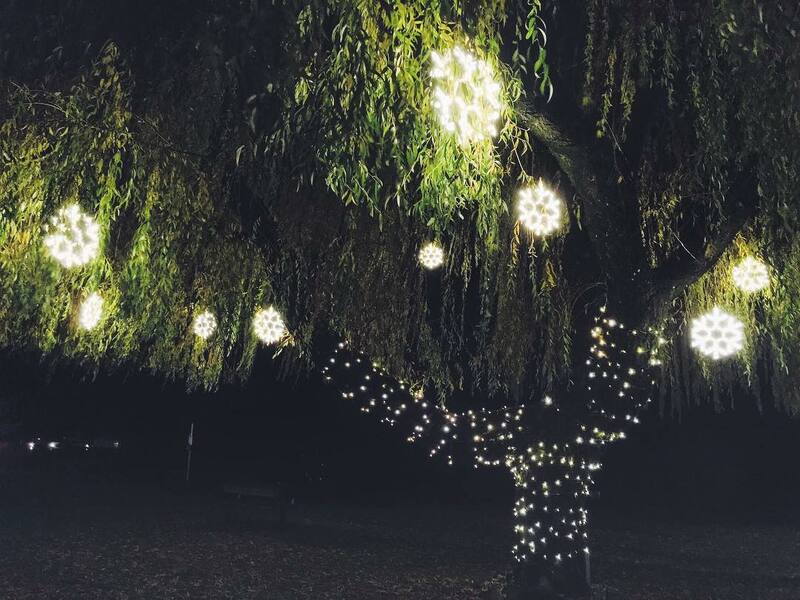 The festive displays are sure to put you in the Christmas spirit, and, if that doesn’t do it, check out Christmas in Memorial Peace Park from 4pm – 6pm on December 1st. 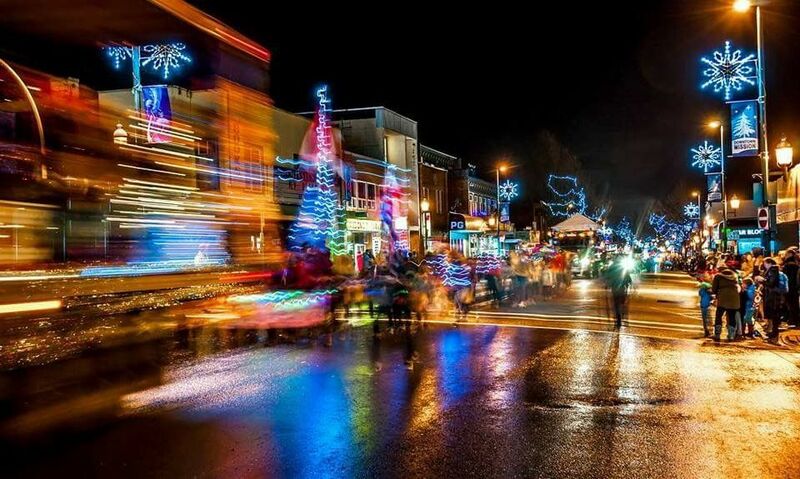 There will be Christmas lights, treats, music, crafts for all, and to finish if off, the Santa Claus Parade begins at 6pm. 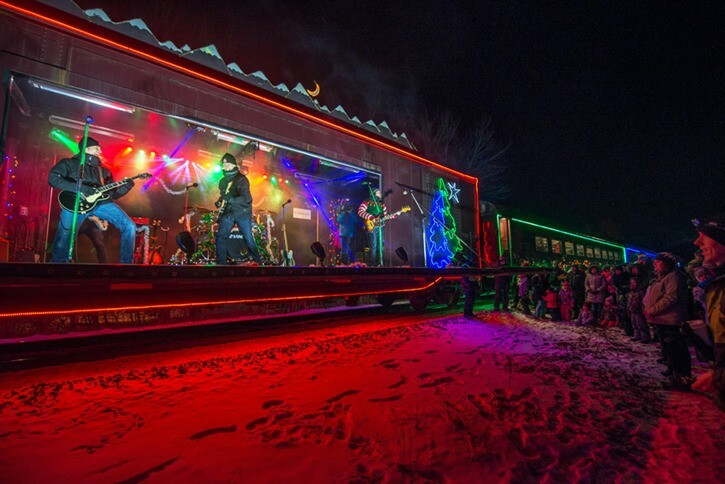 The CP Holiday Train began raising money for local community food banks along the CP route 20 years ago, and have since raised $14.5 million, and 4.3 million pounds of food has been collected. There are two CP holiday trains, one going through the USA, and one going through Canada, each about 1,000 feet, with 14 brightly decorated train cars. This is a must-see for families and train-lovers! The event is free but food or cash donations are welcome. Make sure to dress warm, and come early for a good spot. On December 17th, the Holiday Train will be making its Scenic7BC stops, arriving around 5:05pm in Agassiz, across from the Agricultural Centre on Pioneer Avenue, and at 7:30pm in Haney/Maple Ridge, across from the Billy Miner Pub. Be sure to send in your holiday photos of or with the train for the “Capture the Spirit Photo Contest!” Six lucky winners will win a trip for four aboard the 2019 CP Holiday Train, and a $1,000 donation to their local food bank. The Harrison Lights on the Lake can be viewed at night along the front of the lagoon, and the 1st Annual Opening of the lights was on November 24th, while the festival is on until January 28th. As you stroll along the brightly lit waterfront, this free event is sure to get the whole family into the holiday spirit. Come hear about Sasquatch’s cousin Hugh, and how he saved Christmas. Readings of the Sasquatch Christmas Story will take place in the courtyard of the Harrison Lake Hotel on Fridays from 6pm – 7pm, and Saturdays from 3pm – 4pm. 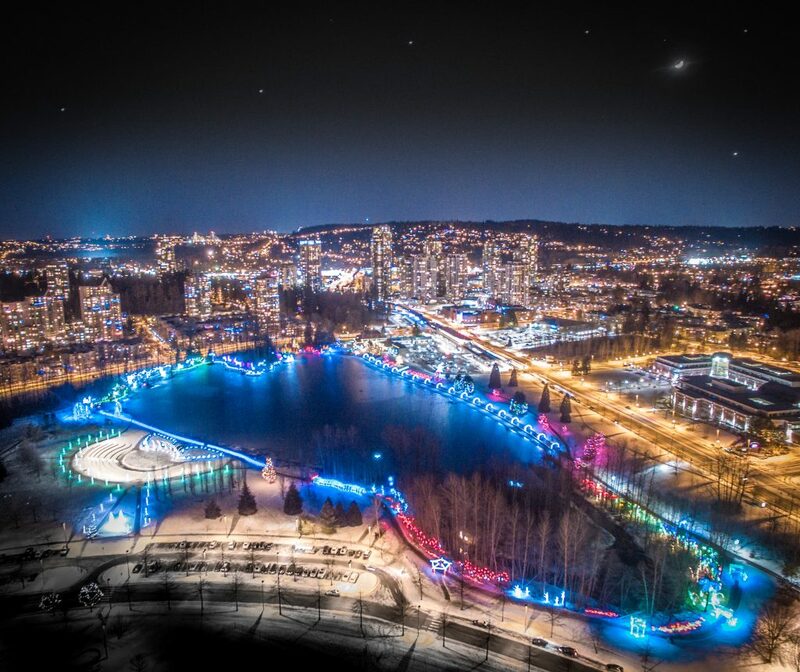 The Lights at Lafarge are a dazzling display of over 100,000 lights that encircle the Lafarge Lake in a 1.2km loop. It is Metro Vancouver’s largest, free outdoor light display, attracting thousands of visitors every year. The season runs from November 24th to January 20th, and is open from dusk until 11pm nightly, and from dusk through midnight on New Year’s Eve. This display is entirely outdoors, so make sure to dress warmly, and wear durable footwear. Site maps can be found at the two info booths on site, and there is limited parking available. Just over a two-hour drive from Vancouver, Sasquatch Mountain Resort (formerly Hemlock Resort) is situated in the coastal mountains of British Columbia, Canada and is a destination for locals and international guests alike.There are many activities for the family and the thrill-seeker, including downhill skiing and snowboarding, a tube park, cross-country skiing and snowshoeing. There are many activities for the family and the thrill-seeker, including downhill skiing and snowboarding, a tube park, cross-country skiing and snowshoeing. 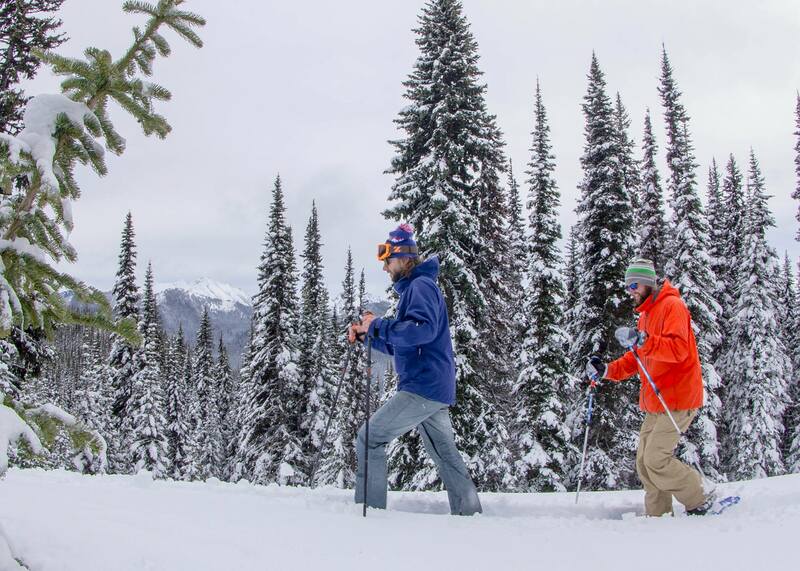 For the outdoor enthusiasts, Hope, Cascades & Canyons area is a winter wonderland. Just 45 minutes out of Hope on Highway 3 (Crowsnest) is the beautiful E.C. 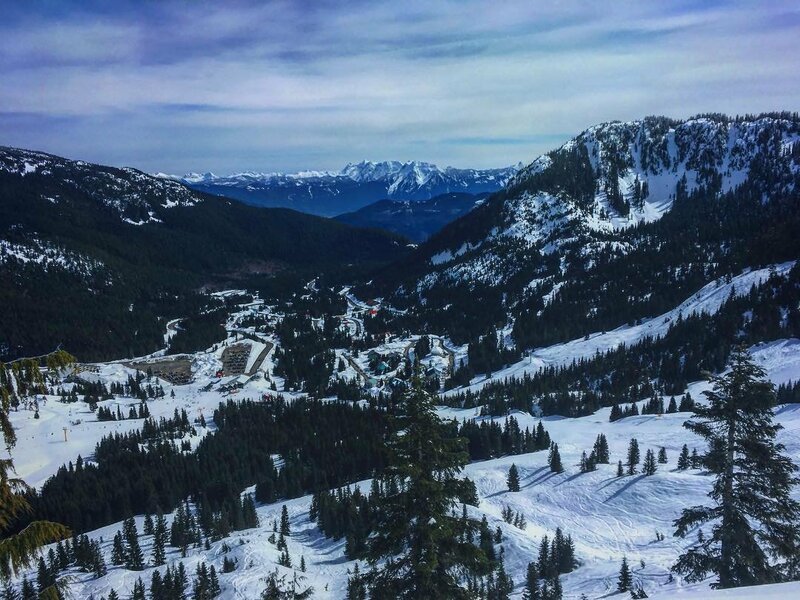 Manning Park, where you can find a winter activity for everyone in the family! There is a wide variety of trails to snowshoe, with guided excursions available. The resort offers alpine and Nordic skiing, tobogganing, and ice skating. 35 minutes out of Hope on Highway 5 (Coquihalla) is Falls Lake, an approximately 4km beginner’s snowshoe or Nordic ski trip. After taking Exit 221, drive through the tunnel under the highway where you’ll find a large open space on your right, with the trailhead located across from it. If you’re looking for something more challenging, Zoa Peak is an 11km return trip that takes about 5-6 hours to snowshoe. To access the trail, drive to the Falls Lake parking lot, and from there go right to follow a forest access road uphill. After about 800m, you should see some snowshoe and ski tracks that you can follow left uphill through the forest, making sure to stay safely in the centre of the ridge. In summer, you can hike to the true summit, but in winter it is safer to enjoy the views from the sub-summit, as there is a steep gully between them. Keep in mind that you will be sharing the first section of both the Falls Lake and Zoa Peak trails with snowmobiles. Back country is bear country, so make sure to stay bear-aware! Harrison is hosting a new event this year “Lights on the Lake” celebrating our long history with the Sasquatch. While it has been widely reported that Harrison is turning into a “Whoville North” this was a misinterpretation that unfortunately has gone viral. At Christmas, Harrison dazzles with light and while some have thought it has something of the feel of Whoville our first year of this exciting three-year program is focused on amazing Sasquatch light displays. We understand that the “Whoville” idea has gone viral and while we have made numerous attempts to correct the narrative unfortunately it was too late. At this point our focus is on communicating through our website and social media what the event is actually about. The inaugural opening of Lights on the Lake will take place November 24 from 4:30-7:00 PM; with the lights turning on at 5:30. We will be offering free hot chocolate to attendees- one per person, while supplies lasts. The Lights on the Lake will be free to observe and will be lit from November 24- January 28, from dusk until 11:00 PM. We are also organizing a Christmas Tree Trail this Holiday season from November 23-January 13. 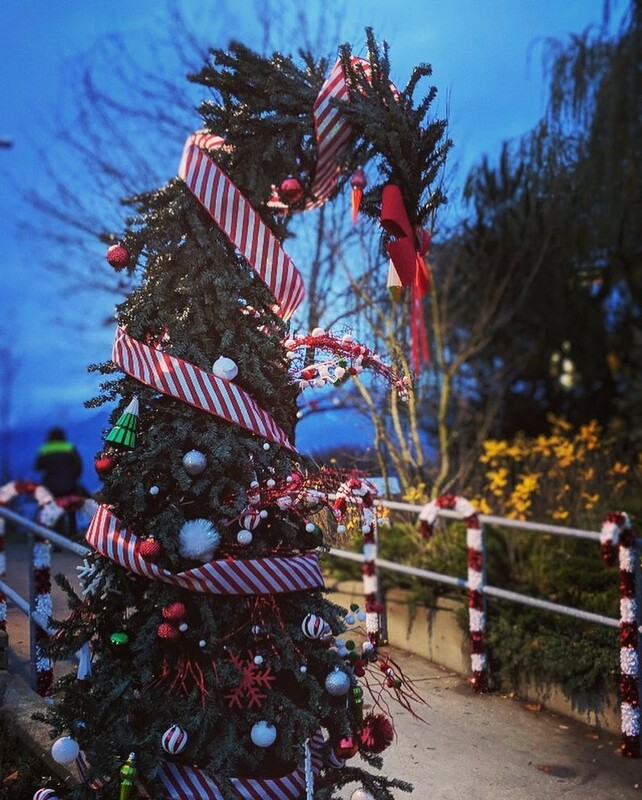 The Christmas Tree Trail is a self-guided walking tour showcasing wonderfully decorated Christmas Trees within select shops and services in the Village of Harrison Hot Springs. Lights at Lafarge Winter Lights Display in Coquitlam, B.C. Here are five things to know about Lights at Lafarge Winter Lights Display in Coquitlam. 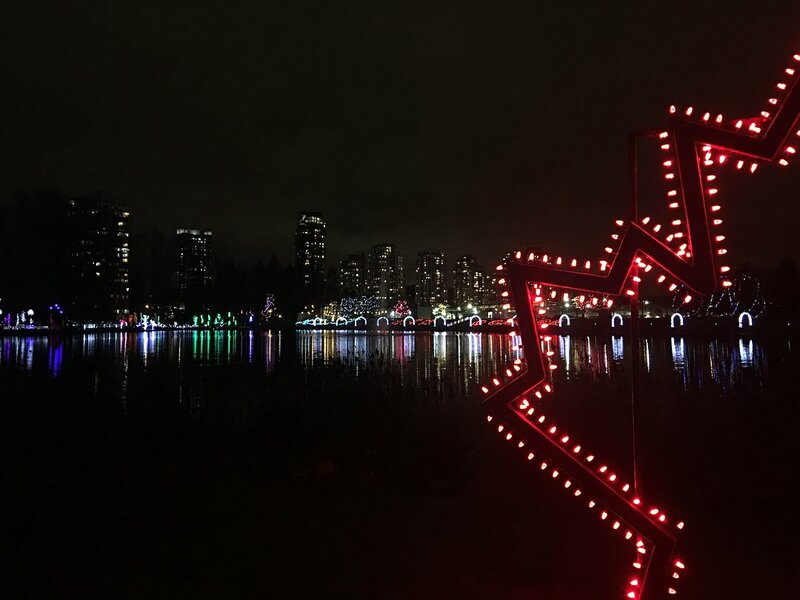 It’s the largest free winter lights display in the Lower Mainland, with hundreds of thousands of twinkling lights illuminating the lake and forest in a spectacular natural setting. Visitors are invited to take part in free workshops at the on-site Welcome Tent to make lights that will be added to the display. Workshops vary each week; watch for schedule information at www.coquitlam.ca/parkspark. This year’s Jingle Bells Night on Friday, Dec. 22, aims to break Coquitlam’s previous record of 500 singing voices. Head to the lake for an evening of carols and lights. Choir groups will be stationed around the 1.2-km trail from 7 – 8 p.m. At 7:30 p.m., stop where you are and join in a sing-a-long of Jingle Bells. In need of a snack or hot drink to fuel your walk? 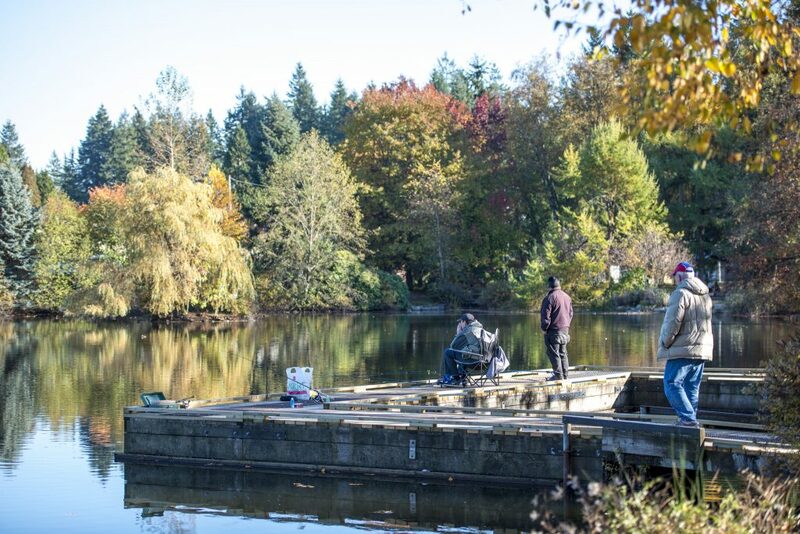 Drop into the concession stand near Town Centre Park Plaza from Wednesdays to Sundays, 4:30 – 9 p.m. Other options closer to Lafarge Lake-Douglas SkyTrain station include Caffé Divano (3003 Burlington Dr.) and Papparoti (1196 Pinetree Way), plus plenty of great restaurants along Glen Drive (walk west of Pinetree). The lights will remain on until Jan. 21, 2018. They turn on each night at dusk and power off at 11 p.m., with the exception of Dec. 31, when they will stay on until after midnight. 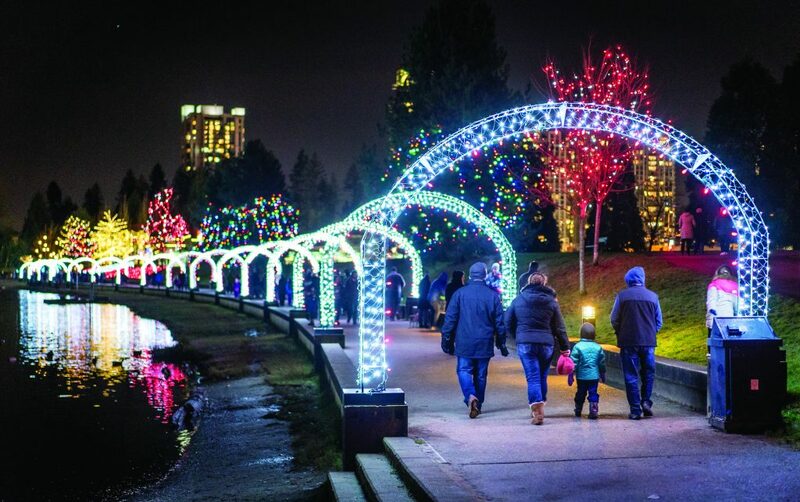 The lights display is located just steps from Lafarge Lake-Douglas SkyTrain station. Limited free parking is available throughout Town Centre Park off Trevor Wingrove Way (No Winter Lights parking at Evergreen Cultural Centre). Stay tuned for further information at www.coquitlam.ca/parkspark. 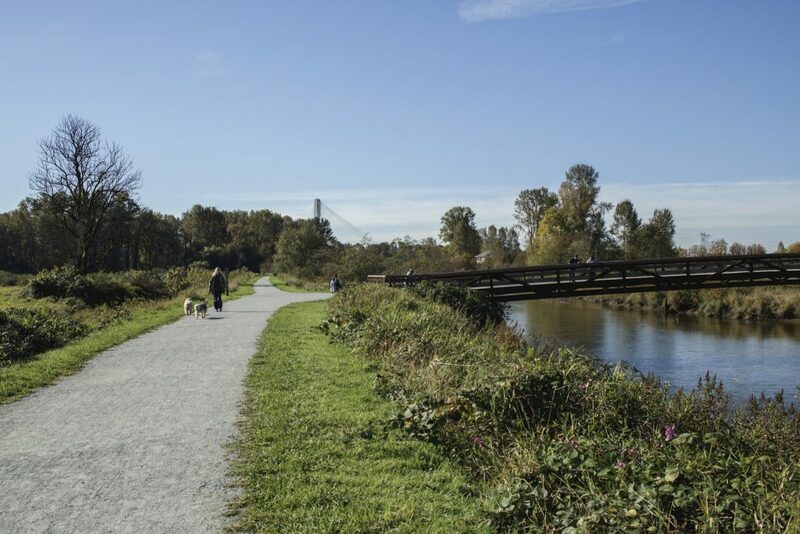 Whether you’re toting a young child or simply in the mood for a short afternoon stroll, these five Coquitlam trails are ideal for all ages and abilities. Did we mention that one of the locations also happens to be home to Metro Vancouver’s largest free festive lights display?